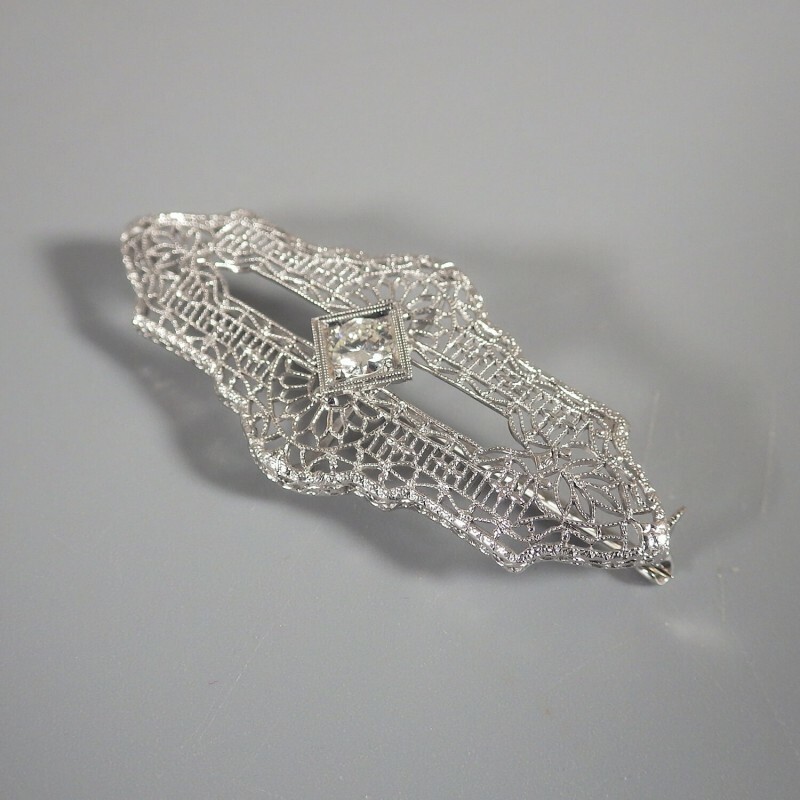 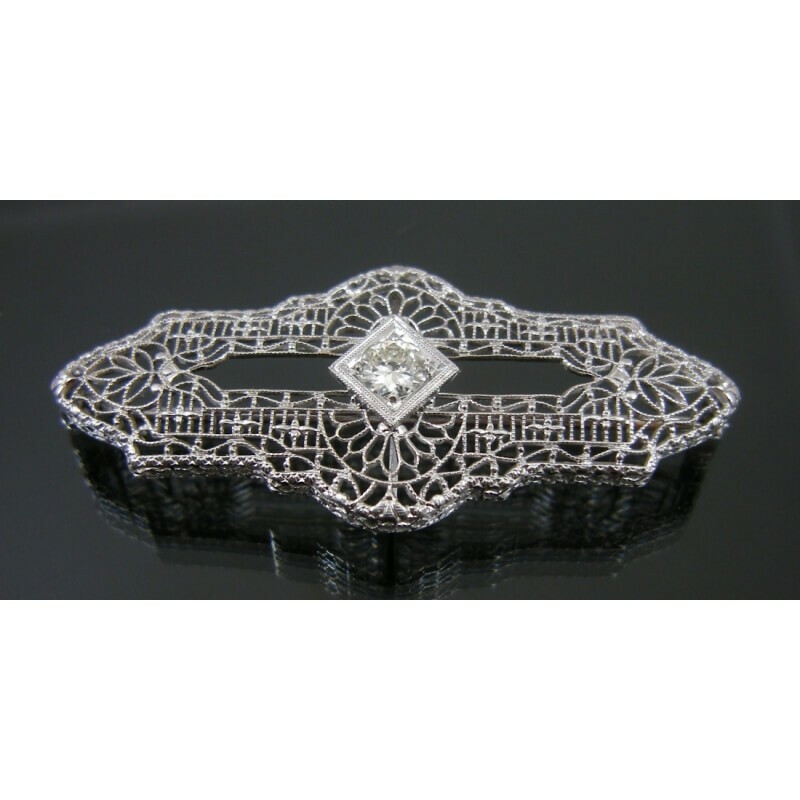 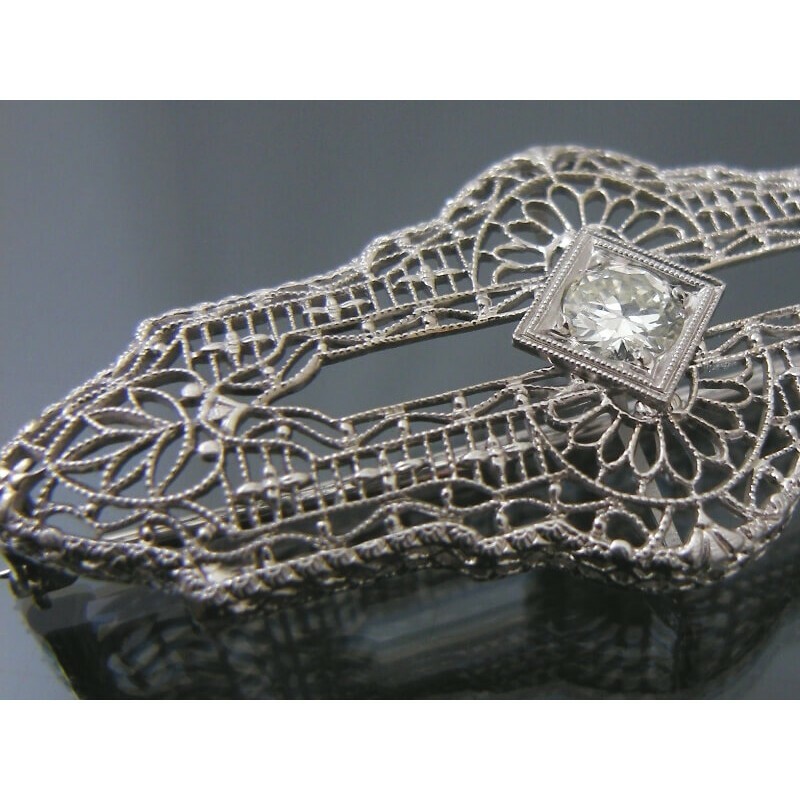 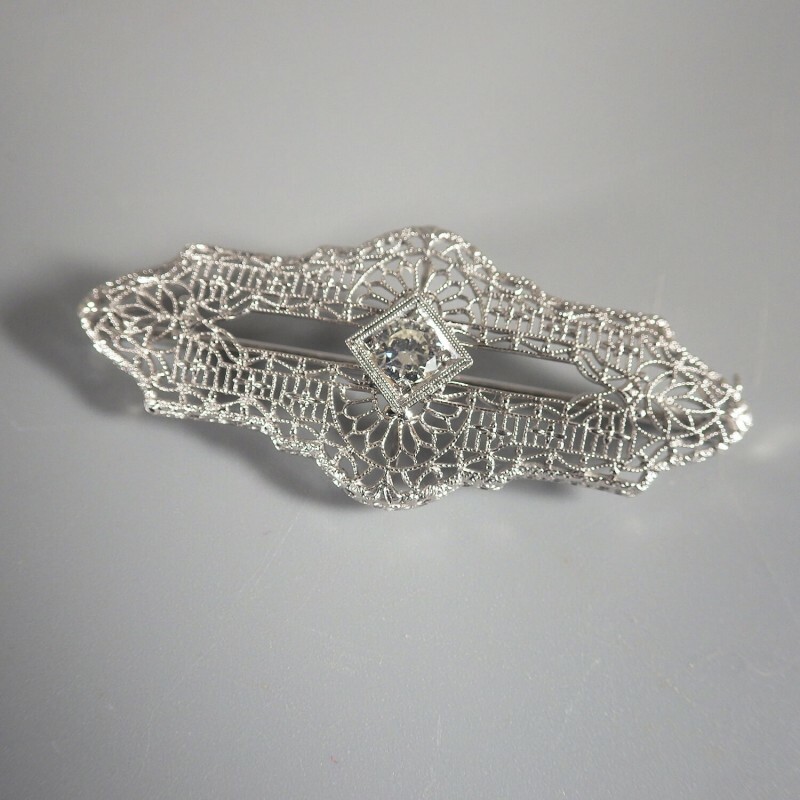 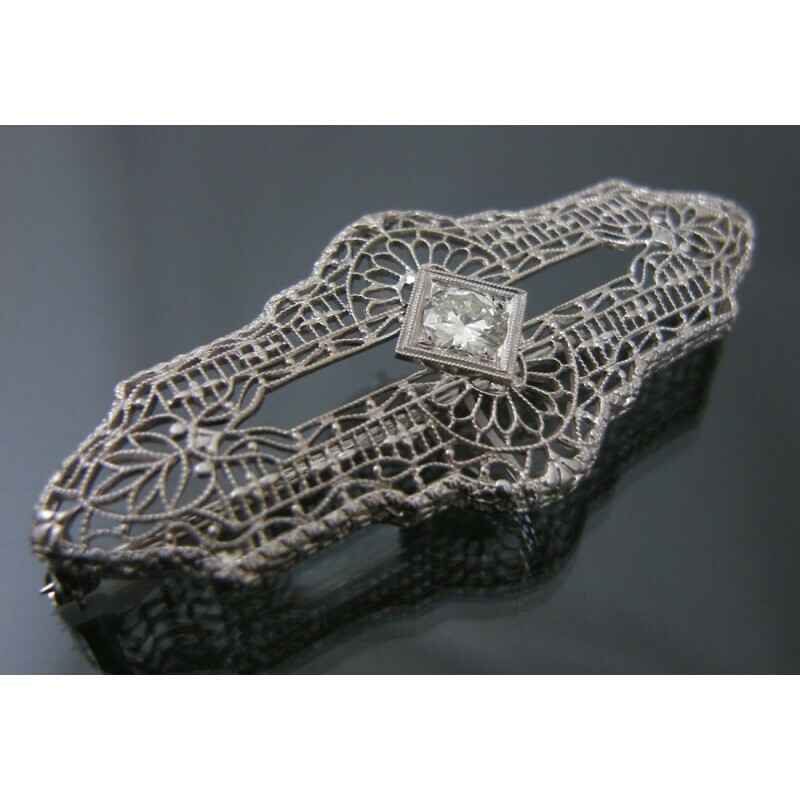 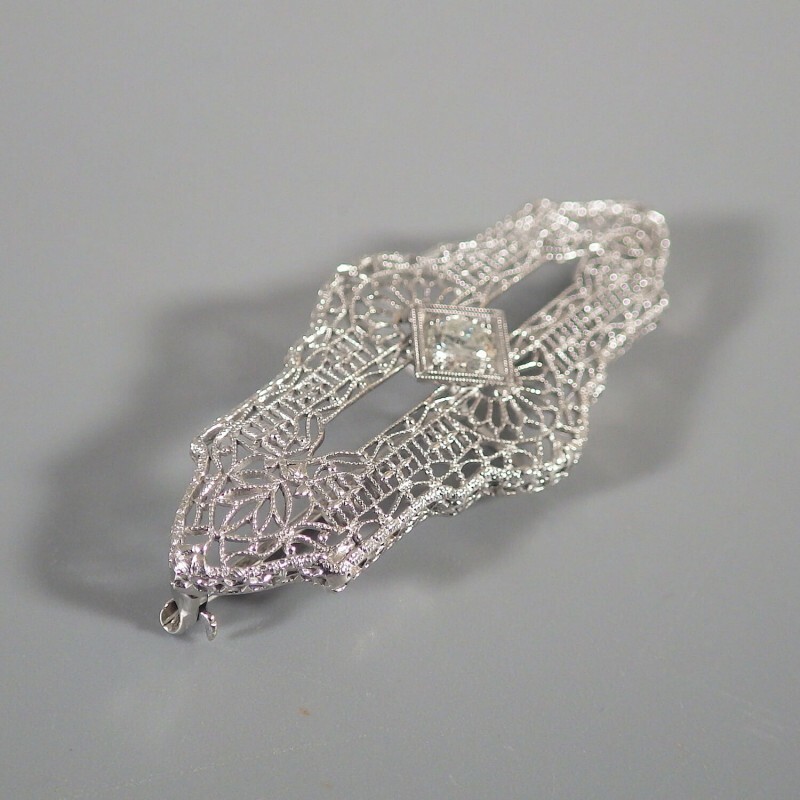 Stunning antique 1920s art deco diamond brooch in 14k white gold and platinum with a fine delicate filigree design, elegant as Belgian lace and the perfect setting for the featured old European cut diamond. 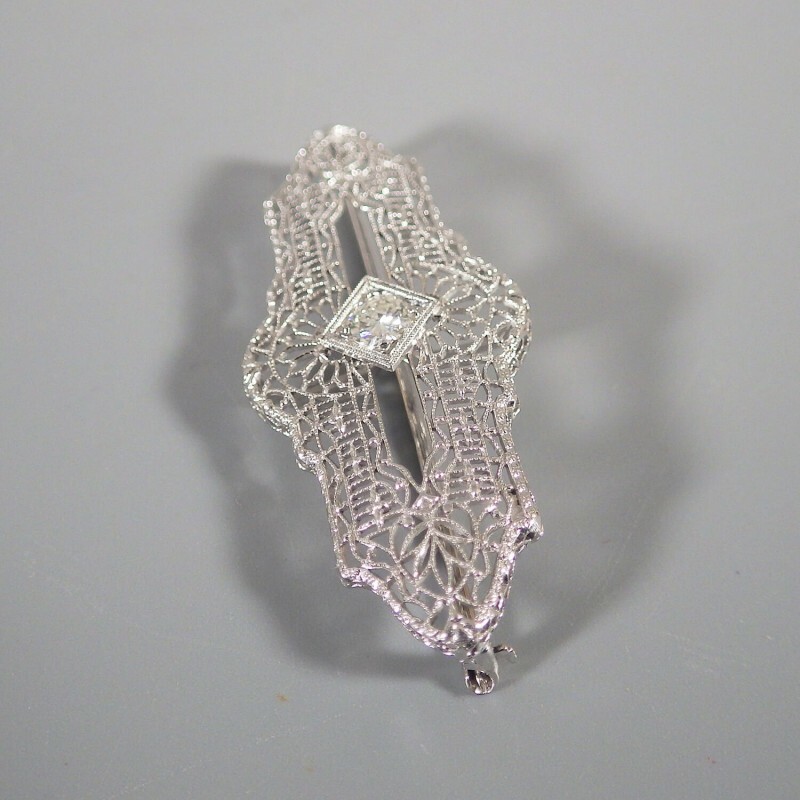 Across the center of the brooch is a narrow open bar, with outstretched ends that come to a point, allowing the garment fabric to be an accenting backdrop for and play peek-a-boo around the .30 cwt European cut diamond. 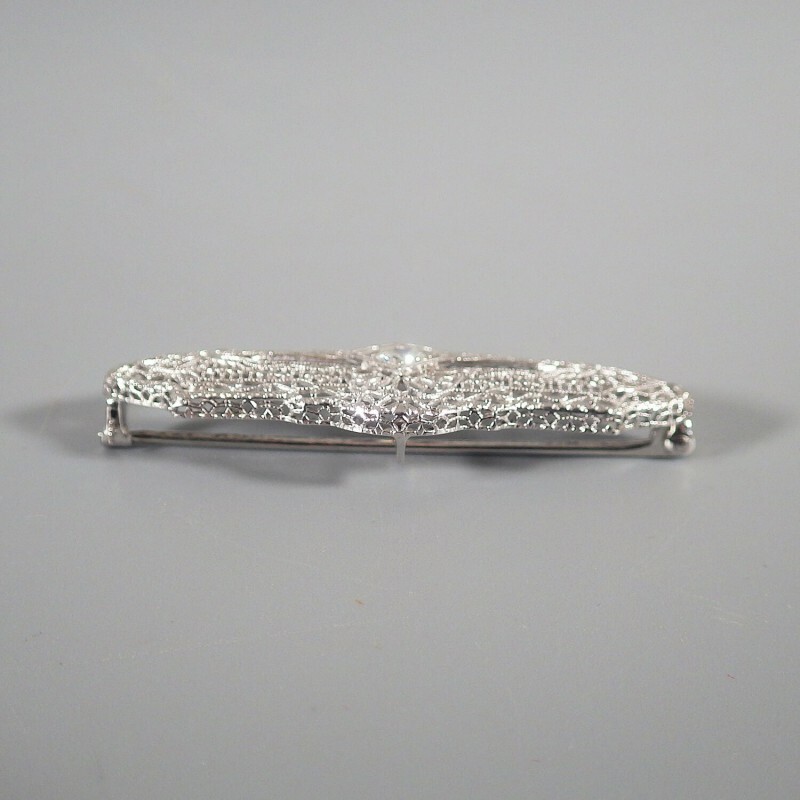 For those who appreciate the elegance of old, this antique 14k white gold pin makes for the perfect vintage bridal jewelry gift for yourself or bride. 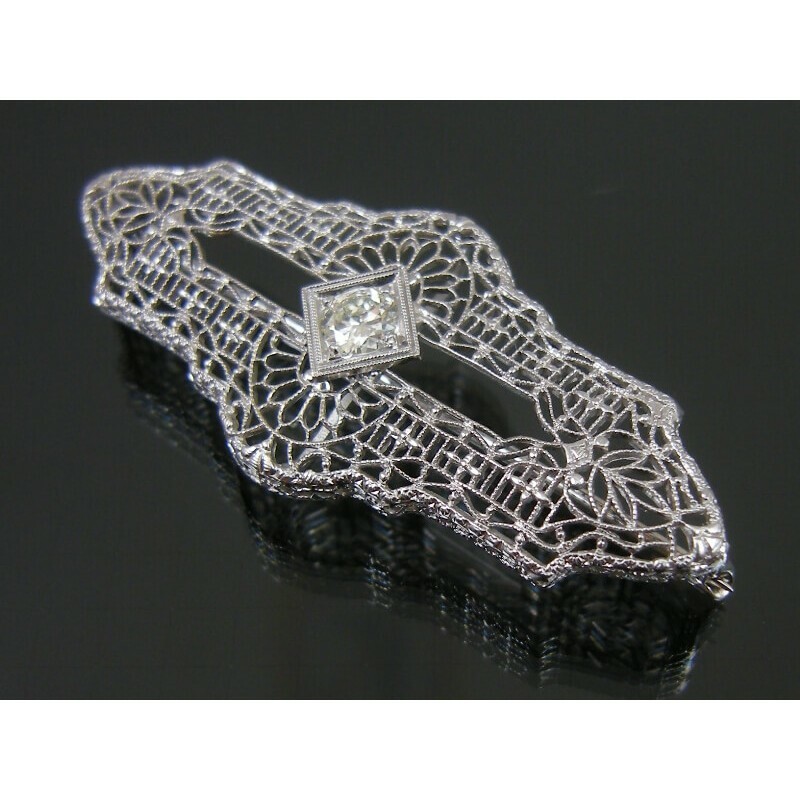 Quite similar to Art Deco Esemco jewelry from the 1920s, the intricate open filigree work exhibits exquisite workmanship - the trail of petite flowers sprinkled along the vertical wire work, the laurel leaf ends, the spectacular arches that serve as the framework for the central diamond, and the milgrain detailing that adds the finishing touch. 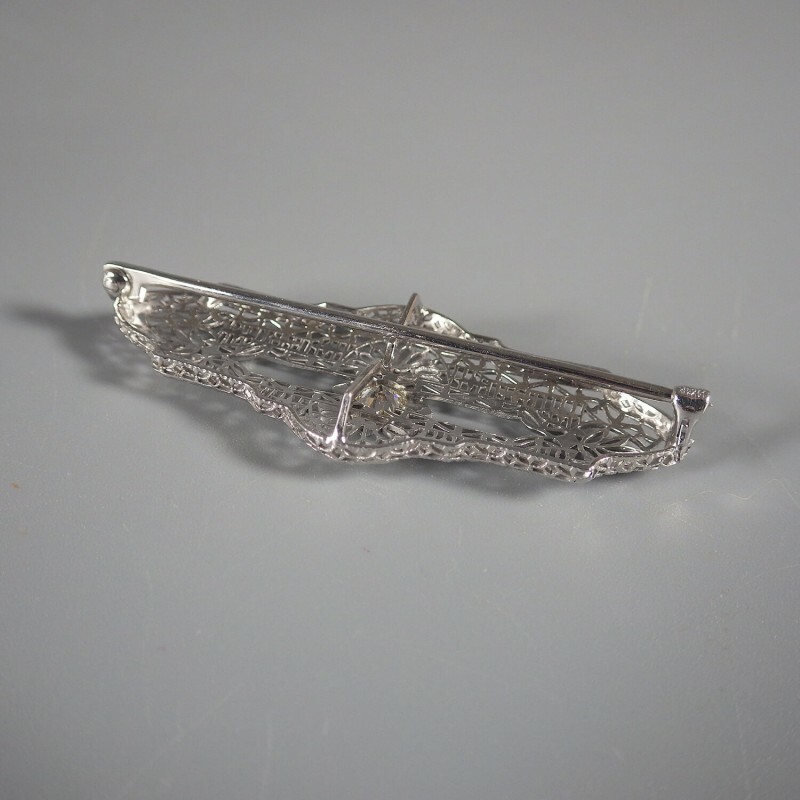 This pin/brooch measures 47mm (1-7/8 inch) wide, 20mm (3/4 inch) high. 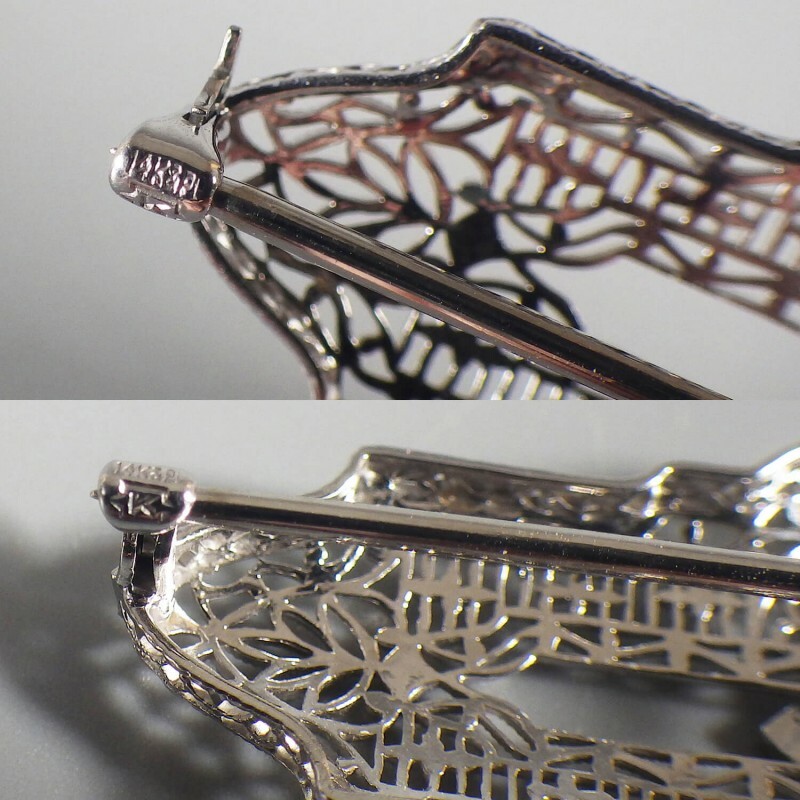 With quality end to end and front to back, you'll note the pin back has a cross bar that runs north and south to stabilize the pin, keeping it from drooping downward when worn. 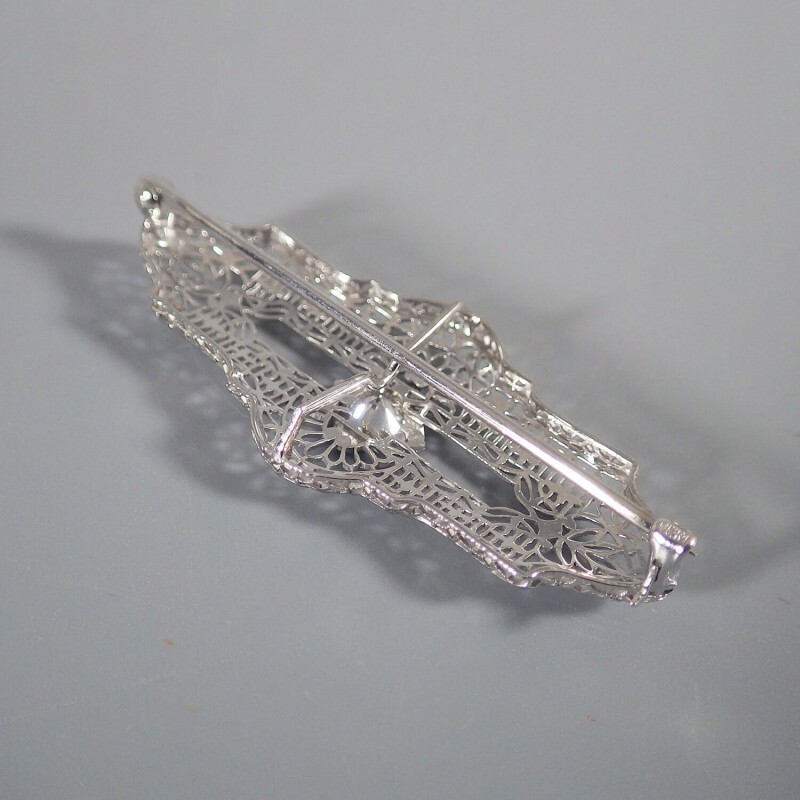 Marked 14K & PL on the safety closure (a closure style popular through the 1920s), and a K maker's mark that I've seen associated (once) with Kohn & Co.
******** A NOTE ON SHIPPING: This brooch will ship via USPS Priority Mail service, with signature required upon delivery.